Grease traps are an effective and hygenic method of separating fat and grease from wastewater flow. 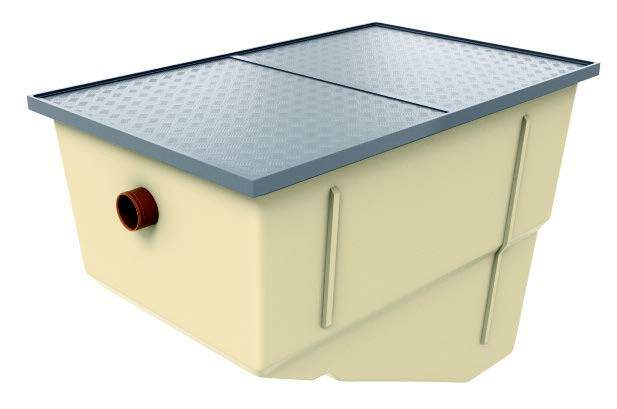 JDP supply a range of grease traps for small restaurants, public houses & canteens, complimented by an extensive range of grease separators for applications such as larger restaurants, hotels, etc, where a grease separator should be considered to give additional volume. Traps and separators allow fats and grease to naturally separate out from water, allowing their removal prior to the wastewater reaching the drainage system. The trap or separator should be installed close to the source of contamination before any foul waste can enter the drainage flow and to suit the expected liquid temperature. The units should be positioned close to the source of contamination, but should also consider the temperature and the nature of the discharge as well as accessibility for emptying. Our experience indicates that units should be at least 12-15m away from the source of the contamination. This distance is normally sufficient to allow cooling of most kitchen wastewaters when the discharge temperature is < 60°C. Grease Traps are installed in dedicated kitchen outlets prior to the treatment plant. The installation should be arranged for gravity feed and discharge. The site of installation should also take into account the need for regular access to remove grease from the surface, debris from the basket (if fitted) and periodic complete emptying possibly requiring road tanker access. units should not be installed beneath pavements or car parks. For further installation information consult manufacturer's guidance.